in Europe from Industry Experts. 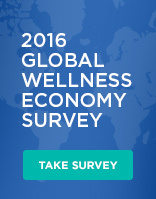 Global Wellness Institute Releases Report and Survey on ‘The Future of Wellness at Work’. Senior Research Fellows of the GWI share the latest data on The Future of Wellness at Work. Hot Springs & Geothermal Mineral Waters User’s Guide now available. GWI Roundtable pinpoints future trends, the influence of technology, and employee engagement in wellness behavior. Has as its mission to empower wellness worldwide by educating the public and private sectors about preventative health and wellness. Calling All Spa Industry People – Please Take This Year’s Key Survey! • Productivity is Declining Worldwide — Is "Workaholism" to Blame?